Every morning once I’ve grabbed my cup of “wake me up”, I head to my desk and troll the internet for interesting stories and coverage concerning ethics, compliance, whistleblowing, etc. And every so often, as I’m reading, I’m reminded that reports of misconduct aren’t just for the large corporations, like Enron, that make world coverage and cost gazillions in legal fees and violations. Frauds and ethics violations aren’t discriminatory in nature, as far as size of organization, or industry. Reading stories from local city and state/provincial publications allows one to see “smaller-sized” misconduct that makes local news and it reminds you that wrongdoing can happen anywhere, anytime, in any sized organization. I was reading about “industry mishaps” the other day. This one is brought to you by the state of MS, and the verb Bribe. It seems that the former head of Mississippi’s prison system has been partaking in the verb [bribe] so much so that he had to resort to money laundering to avoid bringing attention upon himself – leap frogging around town making $9000 cash deposits right, left, and centre, to avoid scrutiny that large amounts of cash would bring. Oh, and he also did a bit laundering through his home mortgage and a beachfront condo. Chris Epps, former MS State Corrections Commissioner, is being accused of taking bribes and kickbacks for prison contracts. Rankin County school board president and businessman Cecil McCrory is accused of giving these bribes. The bribes in question amount to hundreds of thousands of dollars, in exchange for hundreds of millions of dollars of taxpayer-funded contracts. It worked like this: McCrory owned companies doing business with the MS Department of Corrections and paid kickbacks to Epps in exchange for contracts to those companies. McCrory secretly paid Epps in cash or cheques. Epps of course would steer contracts to McCrory’s companies. 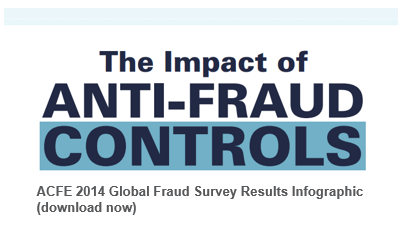 According to the ACFEs 2014 Global Fraud Study, criminals like company. By working together, fraudsters can be more effective in evading anti-fraud controls and steal larger amounts of money from organizations. Frauds committed by a single perpetrator have a median loss of $80,000. But this rises dramatically as more people get involved. In cases with two colluders the median loss is $200,000. And the case of Epps and McCrory, it’s much higher. Many organizations rely on external audits to prevent and detect occupational fraud, however, according the ACFE study, these audits are not very effective and shouldn’t be relied upon as an organization’s primary mechanism for anti-fraud action. External audits are the primary detection method in just 3 percent of all the fraud cases reported. Employee tips, on the other hand, are the most effective according to the study. More than 40 percent of all reported fraud cases were unearthed by a tip. Download an infographic from the ACFE on Anti-Fraud Controls. With whistleblower tips being one of the most effective ways to uncover fraud and abuse of funds, it just makes sense to implement a whistleblower hotline. Organizations with an anonymous hotline are more likely to catch fraud by a tip, compared with those that don’t have one. While employees account for nearly half of all tips, the other half of whistleblowers are from outside an organization. Hotlines are equally effective when customers, vendors, and shareholders know about their existence and are encouraged to use them. It’s safe to say that someone, somewhere, within the MS Department of Corrections, had some sort of inkling that there was something a little fishy going on.